Here are some of the more common questions we've been asked. EPS stands for Encapsulated Postscript. It is a file type that allows graphic images to be transferred from one format to another. EPS is a vector graphics format that we need for engraving logos into glass, crystal, and wood. What file type do you need for 3D images? To sub-surface engrave a three-dimensional object on the inside of an award we use .MAX, .OBJ, .IGS, .STL, .DAE, .FBX, .SKP, .DWG, or .STP files. Vector graphics are different than Raster graphics. Raster graphic files (JPEG, TIFF, Etc) are made up of pixels. These are great for printing and photo requirments. However, for engraving we need to Vector Art so that we can scale the logo to the engraving space on your award or gift item. More information on can be found on our Logo File Requirements page in the Resources section. When can I get a proof? Generally proofs are completed and sent to you within a week of your order (there are some exceptions to this - for long term orders, or when you don't have all your recipient information, we will wait to create proofs until closer to your shipping time). Once your order is entered into our production system, the components for your product are scheduled for manufacturing. During that time, your text and logo are sent to our Art Department where our graphic artists will lay your materials out on a template of the award or gift item(s) on your order. They will make a PDF of the template and email it to your for your review and approval. This gives you the opportunity to double check all spelling, information, etc on your order before it is engraved. Can I get a proof before I order? Generally, this is not how our process works. Proofs are completed after an order has been placed because design files are connected to our manufacturing system. However, no orders are run until you have approved your artwork. What size font can you engrave? In general, the smallest font we'd recommend is 10pt. However, this depends on the font chosen (serif fonts are more difficult to engrave, and read, the smaller they get) and what material we are engraving (glass and crystal are more difficult to engrave, and read, with smaller font sizes). Whenever possible please let our graphic artists assist with font choices and sizes. They will carefully consider the award option you've chosen, the amount of text, and the type of award. We work with a large variety of serif and sans serif fonts. Generally, we prefer to have our graphic artists make the recommendation on what font to use for your award. They have extensive experience and knowledge about what works best on the award you've chosen, with the amount of text you have, your logo styling, and the type of award you are giving. We will certainly try to meet any special requests, including using customer supplied font. For some additional information on fonts, please see our Font Choices Page. How much is it to convert my logo? This depends on your file, and how much time we'll need to spend on converting it to a Vector file type. Generally the cost is somewhere between $50 and $150.00. We can provide you with a quote to do this when you are ready to place your order. What if I have changes after the proof is sent? No problem. This is exactly why we send art proofs out. We want you to be able to check spelling, etc. Your award won't be engraved until you approve your proof. Can I see proofs on multiple awards before I decide which one to buy? Our process is to do art proofs after an order has been placed. This is because our design system is connected to our manufacturing systems. Most of our products are ready for shipment in 10 business days. You can find the production time for each product listed on the tab labeled Packaging/Shipping on each product page. Our Quick Ship products are ready for shipment in 5 business days after art approval and payment is made. If you need your product in less time, there is the option to expedite your order and/or expedited shipping options to get your awards to your facility exactly when you need them. This varies by the product(s) in your order, where they are shipping, and how quickly you need them to ship. Most of our order ship by standard ground freight carriers, but there are many air freight options when you need your items quickly. We can estimate shipping for you, and make recommendations on the most economical and effecient way to ship. When your order ships, our system automatically sends you an email with tracking information. There are a number of options for expediting your order. It depends on the products you need, and the time frame you need them in. In most instances, we can put your order into our Fast Track Production system to decrease the production time for your order. In addition to that, your order can be shipped by 2 Day or Overnight options to reduce your processing time. There are additional fees for these situations, so please contact us as early as possible with your requirements. For more information on Rush Orders, see our Resource Section. Absolutely. We'll need to discuss what products, your time line, and final destination and then we'll create a plan to insure your products arrive at their international destination in a timely manner. All international shipments require additional forms for customs regulations, and will take longer due to the customs clearing process. Planning ahead is the key to making sure international shipments arrive when needed. We regularly ship orders to multiple locations. Discussing this early in your order process will help our team to make the best recommendations for shipping methods and timing to insure all shipments arrive when you need them. Can I have you ship on our shipper number? Generally we can easily ship on your company shipping account, but please speak with your Awards Consultant to make sure we can use the carrier you are requesting for the type of service and location for your shipment. Can you ship to our recipient's home addresses? Absolutely. We can package and ship your award(s) or gift item(s) to inidividual home addresses, regional offices, or multiple facilities. There may be additional charges associated with the packaging requirements for this, so please discuss this requirement early on with your Awards Consultant. We'll work with you to make the best recommendations for your situation. What kinds of boxes do the awards come in? On each product page, there is a tab called Packaging/Shipping where we highlight whether your award or gift choice comes with Standard or Premium Packaging. More information on Packaging is available in our Resources section and in our Video Library. Can I get a fancier presentation box? In most cases, we can offer an upgraded presentation for your award or gift if you'd like one. Most upgraded packaging will inquire additional costs. Please let us know what your requirements are and we will provide options for your review. We offer many types of special packaging services: from special labeling, unique boxes, combined packaging, gift wrapping more. Please let us know what your requirements are and our team will provide ideas and options to meet your requirements. Do you offer Product Returns? Awarding You is dedicated to your complete satisfaction with your order. 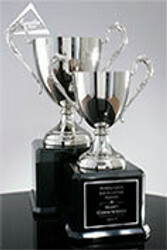 If your award arrives damaged, or broken, or has a manufacturing defect, we will replace your items at no charge. Please check your shipment upon arrival and notify us within 48 hours of any issues. Engraved/personalized products, as well as custom made products are not re-saleable and cannot be returned or exchanged. Bulk purchases and program orders are special manufacturing runs, and cannot be returned for credit. Un-engraved or non-personalized items may be returned for credit within 7 days of purchase if you have gotten approval from our Customer Service Team prior to returning them. Items must be returned in their original packaging, and undamaged. We do not refund shipping costs, or pay for the return shipping costs. Please contact our Customer Service Department if you have any questions. 1-800-753-3384. We do not charge extra for engraving your logo or award text on your award or gift item(s).Engraving is included in the price of your item. 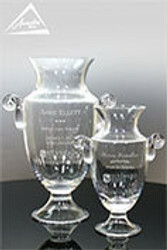 If you would like engraving on an additional location on your award or gift, there may be an additional charge for this. We can provide you with a quotation for this option if you'd like. In general we try not to engrave text that is less that 12pt. 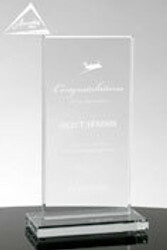 We will generally recommend fonts that best suit the award or gift item that you've chosen, the amount of text you'd like engraved, and the type of award you're creating. In most cases we can find a font size and type that will make the most out of your award choice. There will be times, when we will recommend a larger size award to accomodate the amount of text that you require, or we can offer suggestions to shorten the amount of text to accomodate a particular size award. 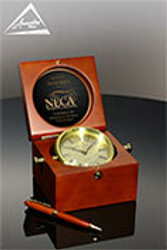 We engrave company and organization logos on almost every award and gift item. Some items do have a very small engraving space, and are best suited to simple logos. In the few cases where a logo can't be engraved on your item, we can make recommendations about engraving your company or organization name in a special manner to make your award or gift items unique and special. Can you engrave product that I own (wine glasses, cheese knives, ornaments, bowls, etc)? No, we’re sorry, but Awarding You generally does not engrave customer supplied materials. Depending on where you are located, you may have a Things Remembered store (www.thingsremembered.com) in your local mall. They will often engrave customer supplied materials. Many jewelers will also engrave customer supplied items. You’ll probably need to make some calls to find one that can accommodate you. Can you engrave a signature? Yes, in most cases we can engrave a signature (or many signatures) if you would like to add that to your award or gift item. You will need to ask the person(s) to sign their name using a black Sharpie pen and to engrave it much larger than usual. Then PDF the document and send it to us. Having the signature larger (and thicker) than usualy allows us to scale the signature down to the size that can be engraved on your item. Signatures can be engraved in glass, crystal, on plaques, vases and bowls, and gift items. 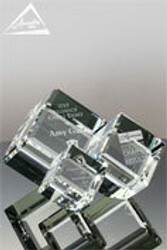 Very small items may not have enough room to engrave a signature along with your award text. Please consult an Awards Consultant to discuss your item choice and the number of signatures you are looking to add to the piece. Do you have standard text for my type of award? We can absolutely help with the wording of your award. Please check the Awards Ideas and Wording section of our Resources section to find options for your awards. Can you help me with wording on my award? Certainly, email our Awards Consultants for help with your award wording. You can also check our Award Ideas and Wording pages of the Resources Section in our website where we've provided lots of wording options for many commonly created awards. How do I layout the text I want to use? You actually don't need to worry about this at all. Our graphic artists will take your logo and the text you provide, and lay them out on a template of your award or gift choice and create an Art Proof for you to review and approve. With years of experience laying out thousands of awards, our team can provide tremendous insight and assistance in the layout of your project. How do I know how much text will fit on my award? Our graphic artists will review the text and logo for your award or gift, and make recommendations on the font size and layout that best works for your project. In some cases, we may recommend a larger size award to accomodate your layout. In all cases, you will receive an Art Proof to see your logo and text laid out on a Template of your award, so you can review and approve the layout for your order before we engrave your order. Do you create custom awards? 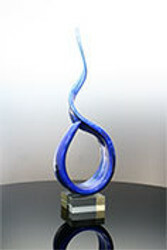 We design and manufacture hundreds of custom awards for clients every year. More information on Custom Awards can be found in our Resource Section. Can you add color to my awards? There are lots of ways to add color to your awards. It depends on the award or gift option you've chosen and the colors you want to add. More information on adding color to your award can be found on the Color Fill and PMS Color Matching page in our Resource Section and in our Video Library. Can I get my logo in color on a plaque? The best way to get your logo in color on plaque is to choose a full color plaque option. We have several choices for this, some with existing color layouts, and some that we can customize just for your application. Some examples of full color plaques include: Full Color Oak Tree Plaque, Full Color Globe Plaque, and the Oxnard Full Color Plaque. Ask any of our Awards Consultants for assistance with this. Crystal is made from many of the same raw materials as glass. Lead oxide is added to these raw materials to give the glass extra sparkle. More information about glass, crystal and other award materials, can be found on our Award Materials page in the Resource Section. How is a plaque made? There are many types of plaques, but in general, there are are two main components to all of them. A wood, or wood finish board, and a metal top plate. 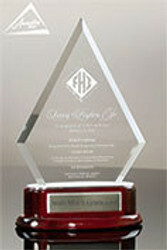 The top plate can be engraved, or color printed with your logo and award text. The plate is then glued to the wood back board. There are many varieties of wood that can be used for the back boards. They are also available is a wide variety of shapes and sizes. 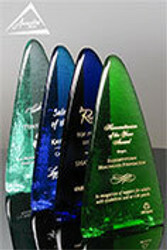 Top plates are available in a wide variety of colors, shapes, and sizes, provding you with many options to create a unique award for your organization. View examples in our Video Library. Engraving is a process where material is removed from a product , either by mechanical or laser engraving. For more information on engraving, check our Engraving page in the Resources Section. Do you color match Pantone colors? We are regularly asked to match Pantone colors in a logo on an award. The process for doing this depends on the award chosen. In general there is a Pantone match fee of $50 per color for doing this. This is a one time fee. We can come extremely close to your Pantone colors, but it will not be an exact match because our materials are different that the inks used for Pantone matching in a printing process. More information about our process can be found on our Color Fill and PMS Color Matching page in the Resource Section. Glass can be recycled. Crystal is not recyclable because it contains some non recycleable materials. 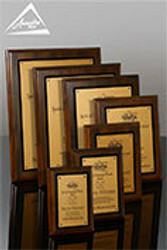 The metal plates on awards are generally aluminum or steel and can be recycled. However, every municipality has different restrictions and guidelines on what can be included in their recycling program so you should check before recyling any award materials. Art glass is glass that has been hand-blown into a variety of artistic shapes. For more information on art glass, please see our Award Materials page in the Resource Section or visit our Video Library. Do I have to use the design that's on the award in the website photo? 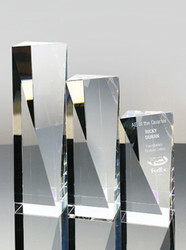 All our awards start blank and can be personalized with your design and award text. 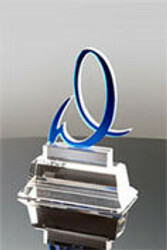 The photos on the website are shown only to provide with ideas on how the award style can be used. Do you have a retail showroom? Awarding You does not have a retail showroom. Our facilities include manufacturing, administrative, sales and support offices. We do offer tours of the facilities for clients with scheduled appointments. Call, email, or Live Chat us if you have any additional questions, or need further clarification. We're happy to help and look forward to hearing from you.